I truly enjoyed reading this book, not only as a preparation for taking the GRE general test, but also as a tool for self-enrichment. I admit that I don't agree with everything the author put into the issue or argument essays, but, that's hardly the point for reading this book, isn't it? The sample essays are truly extensive and exhaustive, serving as good models for students who might not be familiar with GRE writing. Moreover, very often I find that the essays jump start my own train of thoughts, challenging my point of view on an issue or argument, and that's a big part of reading this book is about, I believe. This book truly epitomizes the saying - learning by doing. There is no way you'll be able to memorize all the essays in this book so if that's what you're looking for, forget it. 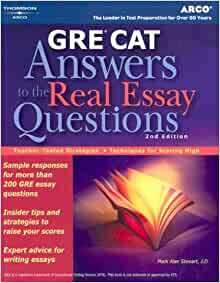 If, however, you are looking for tips on how to prepare for the essay portion of the GRE, common themes you'll find, and you want to review well thought out essays for every possible essay topic (just to get ideas and to get your creative juices flowing), this is the book for you. I thoroughly enjoyed using it as a study guide and found myself well prepared when I actually sat down to complete this portion of the GRE. As I wrote, so many ideas came to me, many of which were touched on in the book. My score was a 6.0!